I hope to try out a lot of new recipes for our Romertopf in the coming months — and if you’ve got a clay pot or similar baker and want to get more use out of it, today is your lucky today. Always soak your Romertopf for about 15 minutes with cold water before adding ingredients. This allows your food to steam and cook evenly later on. You can convert your regular recipes to Romertopf recipes just be increasing the cooking temperature by 100°F (50°C) and subtracting 30 minutes from the cooking time. Cut ingredients that cook really quickly (such as carrots or broccoli) into larger pieces than usual and cut slow cooking foods into smaller chunks (like potatoes). If you plan to put rice, beans or other dry ingredients into the Romertopf to cook, make sure you put them in first and add enough liquid to cover them. Place your Romertopf into a COLD oven, on the bottom shelf (or as close to the bottom as you can get), to make sure the heat circulates properly around it. Wash your Romertopf with water and a nylon brush. No soap is needed and it may actually seep into the terracotta, causing it to give your food a soapy flavor. Baking soda can be used for tough spots as needed. Ultimate Cheater Pulled Pork — There are few thing on earth better than a good pulled pork sandwich. But making it without a smoker just doesn’t feel right. Until I came across this recipe that makes me want to go out and buy a pork shoulder this weekend. Seriously, pulled pork in my oven would be so awesome. And be sure to check out this brilliant idea of using the paddle attachment on your KitchenAid to “pull” the pork or chicken. Chicken Tarragon — Similar to a curry, this chicken tarragon recipe is sure to have your mouth watering and your family asking for seconds! Osso Bucco (Braised Veal Knuckle) — We have made this “the hard way” several times recently and it is heavenly, but I never considered you could also make it in the Romertopf which seems to be incredibly easy. I really can’t wait to try this Romertopf recipe out soon! Randy’s Roasted Chicken with Leeks & Apples — Just to show you that you can cook chicken with practically anything and make it come out delicious, try this leek and apples combo for a slightly sweet chicken that will melt in your mouth. Lamb Stew — For the times of the year when you just feel blah, a good stew is hard to beat. And topping it with a Creme Fraiche blended with parsley sounds like something I would really enjoy. 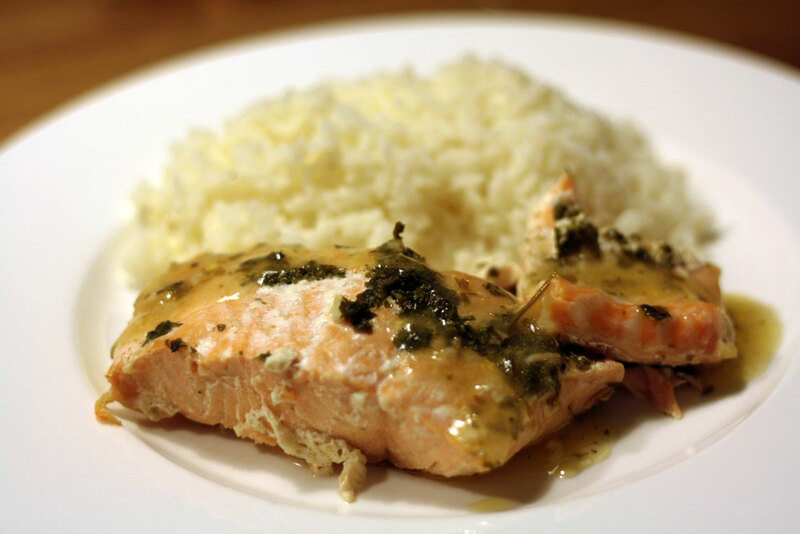 Beer Poached Salmon in the Romertopf — This is one of our favorite ways to cook salmon because it’s not only delicious and makes your whole house smell good enough to eat, but it’s also insanely simple. Moroccan Chicken — If you are looking for a flavor explosion with influences of the Orient, this is the recipe for you. Paired with apricot couscous, it’s a flavor like no other. This recipe is for a crockpot, you can add everything to your soaked Romertopf for 2 hours at 400 degrees and get the same delicious results. Lemony Thyme’s Roast Chicken — The bed of fresh ingredients that Libby creates for this chicken makes my mouth water! Super simple but a complete meal in the pot. Lamb Shoulder with Potatoes, Zucchini & Tomatoes — You don’t have to twist my arm to get me on board with trying a lamb dish. This blend of flavors with the curry and paprika really sounds delicious. And since it’s coming from Alsace, where I’ve never eaten food I didn’t like, I think they probably know what they’re talking about! Curry Chicken — I love a good curry but it all depends on your spice blend…and there are a lot of different types of curry blends. This particular dish cooks very quickly and sounds delicious! 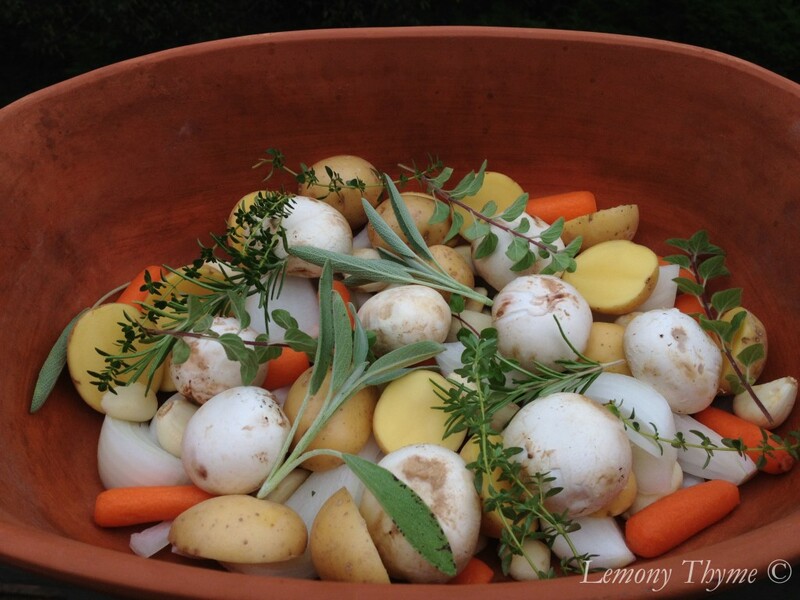 Have you ever tried cooking in a Romertopf, clay pot or something similar? What are your favorite recipes? Share with us below! Can you share your recipe? What size clay baker do you have? Can you tell me how you use it for no knead bread? Just like a regular Dutch oven? Pickled peaches take on a bit of a spicey taste. I use them as a breakfast garnish. I use a simply syrup recipe then add pickling spices, and for looks i add red food coloring bring to a boil then pour over peches while hot. Wait 24 bours and beautiful delicious peaches. They also make great parfaits. Pickled peaches are made with cider vinegar, sugar, cinnamon and cloves. They are wonderful. The taste is not so much pickled as spiced. They are quite popular in the Midwest. Pickled peaches usually have vinegar in addition to the sugar in simple syrup, so it is more of a sweet/sour flavor. Additionally many recipes for pickled peaches include clove or cinnamon. Pickled peaches are delightful,but have a strong flavor that may take some getting used to. Eating a cucumber with a little salt and some rice wine vinegar would be more like eating peaches in simple syrup. But a pickled peach is full strength.You will definitely taste the cloves and cinnamon,with nice peach flavors at the end. I’ve never been able to eat more than one, usually with a holiday dinner. The vinegar flavor is much milder than in pickles. Closer to bread and butter pickles than to dills. Give it a try! Do you know how to cook a beef brisket in a claypot? Thanks! We haven’t tried this yet but have been thinking about it. I’ll be posting a rib recipe later this week that is a bit similar. Basically you’ll just need your veggies in the bottom (potatoes, onions, carrots — root veggies tend to do best) with broth or beer. Then your brisket on top, rubbed down with spices and a sauce if you like. Bake it at 400°F for about 2-3 hours. I would check it after about 1.5 hours to see how it’s coming along and adjust time accordingly. I hadn’t thought of using it for bread. Can you share your recipe? I bought a clay pot at a charity shop. It has a glaze in the bottom section. Is this how they all are? I am keen to try it to cook some different meals in. Yes, they should always have a glaze in the bottom part of the clay pot. It will keep the ingredients from seeping into and through the pot. Normally when you wash them, you want to use little or no soap because it also seeps into the terracotta, making your food taste soapy. Oh thank you, I would not want my food to taste soapy. I just got my first Romertoph Mailed to me today. I’m just trying to learn as much as possible. Absolutely not. I’m sorry but I totally disagree. The ones glazed may be used for vegetables. Not intended for beef, pork or poultry. I’ve been using my Romotophs for years. Hi Tami. Perhaps some are not glazed, but all of mine are and they are new and old versions. The glazing is only on the inside of the pots. This is good to know, because neither of mine are glazed. Sorry – ALL German Romertopf have a glazed bottom. Some unglazed pots were made in Mexico but have been discontinued. Still have my Mothers, made in late 1960’s and brought from [then West] German – yes it has a glazed bottom. Ridiculous! The famous Romertopf (German) clay baker is glazed on the bottom. They have been in business for over 50 years. Their German clay, of use, is pristine and their glass glaze is safe, and free of chemicals. Whereas, the clay vessels that are not glazed, leave an odor from previous foods, and can be prone to bacteria. My Romertopf does not have a glazed bottom. That’s not a problem. It may be a bit more porous but still functions in the same way from what I hear. Haven’t owned one myself without the glazing. My large romertopf clay cooker is unglazed. Is it safe to use? not all Romertopfs are glazed, have a look on their website to see if you can find the one you have, this is what I did when I bought mine from a charity shop. W Germany on the bottom. Anyway, after taking the food out I put water and soap in the bottom of the pot and left overnight! The next day it hit me I probably should not have done that because it could absorb the soap. Now what do I do? Help! I’m afraid to use it again. Maybe put a loaf if bread inside and bake it? Hi Maria. I’ve had mine in contact with soap a few times. I’d suggest giving it a good soak and using a bit of white vinegar. You’ve got to flush the soap out a bit, but the inside does have a strong coating so the soap probably hasn’t penetrated as much as it would have on the other side. Nice find and enjoy your Romertof! My directions say to soak in water then add vinegar water and cook in oven until boiling. According to the official Romertopf website if your pot needs a deep cleaning – fill the body and lid with a vinegar/ water solution (1:3) and bake in a 200 degree oven for an hour. This should clear the pores of the pot. I have also read that the top and bottom can be boiled for 30 minutes to clear the pots pores. Doing either will remove any “seasoning” the pot has so your foods may stick until it re-seasons itself. Thanks, Michelle! Great tips for cleaning!! Waking up an old thread here. We bought a “Gourmet-Topf” at a thrift store for $7. Don’t know what model it is, but it says Made in USA, is unglazed inside, and is big enough to hold a 6 to 8 lb chicken. Used it that night with great results, but we didn’t know not to use dish soap to clean it. Then I found this thread and realized we’d made a mistake. So I did the vinegar and water 200-degree oven thing, and when that was done I left it to soak in warm water. An hour later I checked on it and it was discoloring the water, sort of an amber beer color. I assume this is from the previous owner’s food. So I left it soak for a few more hours, then changed the water. It’s still soaking now. The oven treatment and the first long soak have already removed almost all visible evidence of previous use, but I’ll continue soaking it until it stops leaching out and discoloring the water. Never use soap in a clay pot, to clean, getout you largest soup pot or lobster pot or I guess the oval dutch oven would work , fill with water, bring to a boil an immerse the romertopf, keep it at a simmer for 10/15 mins – that how i do my r pot, maybe once a year or so. Hi! I’m hoping to bring my 1980s Romertopf back into service now that I have an electric oven again. Do you know of any slow-cooked lamb shoulder recipes for the Romertopf? Or where I might find some, please? I’m a fan of slow cooking (e.g. 130 degrees Centigrade) but have never done it in the Romertopf so need to know temperatures and timings. My Romertopf isn’t glazed, by the way. If that makes a difference? I read somewhere that if you cook a lot of fish in a clay pot, the pot will absorb the fish smell and taste. Have you found this to be true, and is it better to have a separate clay pot for fish? I got a Schlemmertopf for Christmas and am eager to try some of your recipes. If there is a coating inside, I don’t think you should have an issue. We used to cook salmon in ours every few weeks and never had a smell issue. Have fun using your new Schlemmertopf! I have two Schlemmertopf which have a glazed bottom. The smaller one is for fish. I have two unglazed Romertopf’s for all the other meats…a large and smaller one…tbey all have been great cookers. I was lucky enough to find a Roemertopf in a thrift store for $5. I have baked bread, hot cross buns and lemon braid in it and today I tried a roast chicken with vegetables. It was delicious. 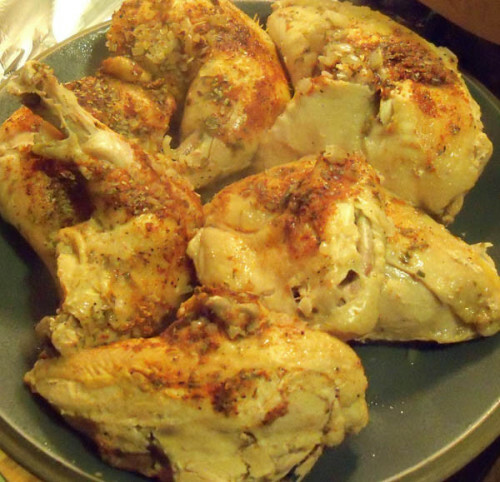 I look forward to trying a few more recipes and this is how we will cook our roast chicken any other way. I may get a second pot so I have one for bread and a second one for savoury dishes. I have two reston Lloyd romertopf clay pots. The larger one I use for meals and the medium one I use for breads. Thanks for sharing, Norma Jean! I love my Romertopfs as well. I have a bread one, a modern looking mid-sized one, and a large one for when I cook for guests too. Love them ALL!! Never burned anything in ours either, and nothing comes out overcooked either, which is amazing. Thanking you for posting these mouth-watering recipes! I’m wanting to make the Lamb Stew and Moroccan Chicken….but it seems both of those links are broken. Could you please check on that….as both of those sound yummy! Thanks again. Thanks! I’ve updated the links to new similar recipes since those were gone! Has anyone tried oven fried chicken in the clay baker? If I brown the coated chicken first and then put it in the cold romertopf, could this work? I haven’t tried it but I think you could. I usually put chicken on a bed of vegetables and broth or beer. It browns quite a bit that way was well but I haven’t thought of coating them. I bought both an unglazed claypot and a cookbook COOK IN CLAY with Glazed Schlemmertopf. It has “75 easy to do recipes.” It must be an older publication with no Pics and a price of $2.50. I would be happy to scan and send any most desired recipe. The tend to be a bit old fashioned, canned soup, corn, like that. Let me know. Hi, I sure would like to have you send me some recipes, beef pot roast and other beef dishes, fish, vegetables, no pork or lamb, please, breads, cakes etc. Thank You so much. That is so sweet of you. I have had this roemertopf with glazing at the bottom, for at least ten years and never used it. All these glowing reviews made my mouth water! Thank You so much. That is so sweet of you, to offer to send recipes. My partner has cooked for some quite salubrious establishments and wants me to tell you how impressed he is with Randy’s Chicken with Leeks and Apples recipe. “Best meal of the month!” he says… Thank you for a delicious meal today! If I am cooking a 6+ chicken roaster do I increase the time from 90 minutes by 15 minutes? Cooking time for roaster larger than 4t to 5 lbs? I have been cooking with a couple of Romertopf unglazed pots since 1976 (yup, the same pots) and have several cookbooks by various authors/manufacturers. The very best recipes I have found are Chicken with green chiles and cheese, found in a Romertopf cookbook from the mid-70s, and a delightful lemon cake. It sure would be nice if the company would publish those recipes again for those who are newer users of the pots. what about a whole fish such as red snapper? any suggestions? Anyone have great fish recipes? We have done salmon filets. If you do filets versus whole fish, your cooking time will be much faster than chicken or beef. 1 green bell pepper, chopped, or 5 to 7 jalepeno chilies, seeded and minced. Prepare the rice using the package directions. Combine the garlic, bell pepper, tomatoes, onions, cilantro, 1 tsp. salt, 1 tsp. pepper and olive oil in a bowl and mix well. Rinse the filets with cold water and arrange in a medium baking pan; do not allow the fillets to touch. Sprinkle with 2 Tbsp. of pepper and 1 Tbsp. Kosher salt. Spoon the tomato mixture over the fillets and drizzle with the lime juice. Bake at 350 F, covered with foil for 18 to 25 minutes or until the fillets flake easily. As long as the heat level is the same, it shouldn’t matter. But my electric oven on bake heats from the bottom. When you use broil, it uses the upper heating element. I made the chicken tarragon and it was totally scarfable! I’ve had a clay pot for years and have cooked a few times with it, but I did not know to soak it for a few minutes before cooking with it starting in a COLD oven. Everything always came out good, but not THIS good. I will try every single one of the other recipes and return to this one time and again. So glad you enjoyed it Nanda! Happy cooking! Tiffany, are you still blogging here? I have a 111 Reco/ Mexican, Romertopf. It performs well, and I too use it mainly for chicken. I also have a small Schlemmer-topf used for fish, A large Schlemmertopf used for chicken and beef dishes…and soups. The Schlemmertopfs have glaze, the Reco does not…all are good. I recently picked up a #212 Gourmet-topf, unglazed. I am looking forward to using t soon. Anyone you have run across that has use a vintage Gourmet-topf? There has been a mention or two of unglazed Romertopfs here – perhaps it was a vintage Gourmet-topf instead? I haven’t had one yet myself but welcome hearing more about how your experiences go! 2.. as I have mentioned before, I have 2 Schlemmertopfs with the lower glass finish. The smaller is the one I cook fish in. Mainly Salmon and Tilapia. the largest is medium sized. I have used it for pork and beef entree’s. It, too, has performed extremely well with hardly and soiling. The lower glass finish, rally heps you in cleaning. I alo cooks as my 111 Reco Romertopf. 3. I did pick up a Gourmet-topf #212 unit. I has no class lining, just bare clay. It has some soiling from cooking, mainly larger chickens. Yet it is a fine unit! Oh, I have used it cooking Beef Burgundy. some Red Wine stain but not bad. 4. I have a #113 large Romertopf. It is glazed. I have made one large chicken in it and with tons of veggies with it…it is a keeper! Hi I am originally from the Uk now living in Bulgaria. I have just bought an unused Romertopf from a second hand shop for the equivalent to $7. I am 55 yrs old and remember mum using one when I was a child. Mum is now 89 and staying with us on vacation so she is looking forward to teaching me this week her dishes. Thx for the great advice given here. Hi Tiffany, I just stumbled upon your site searching for Romertopf Clay Pot Recipes. I have a few pots from garage sales, etc. and only used one once. I cooked a whole chicken but did not put any vegetables in the pot first, so the chicken skin stuck terribly in the pot and I haven’t used it since. Now I’ll get it out of mothballs and start using it. Anyone have a recipe for a rib roast in a clay pot…I loved mine..but only cooked chicken.Ready to pull it out again! Thank you for all the information on this site. I just received my Romertopf from Amazon today. Here is the most sumptuous pork recipe that I have used in my crock pot. It is layered with flavors. Layer sweet potatoes on bottom, then red peppers, onion, the pork (I brown on all sides first). Pour tomatoes over meat, beef bullion, squeeze lime, add can of green chilies, chipotle in Adobe sauce and raspberry chipotle sauce. Sprinkle with all spices, garlic and cilantro. Cook on high for 6 hours. Since I am yet to be familiar with a clay pot, I’m not sure what temp or how long. Maybe someone with experience would comment with their knowledge. The combined flavors of this recipe is amazing.